It is rather difficult to download ISO images for previous versions of the Microsoft Windows operating system from official sources. Microsoft wants users to use the company's Media Creation Tool instead which downloads and creates installation media on a system running a supported operating system version. While that works at times, it does not take into account situations where users may not be able to run the program. This can be the case if the existing installation of Windows is corrupt and cannot be repaired anymore, if you run Linux or another operating system, or if you bought a computer without an operating system. Update: The Techbench website is offline currently. It is unclear if this is a temporary issue or if Microsoft made the decision to pull it from the Internet. You can download a Windows 7 ISO image or a Windows 8.1 ISO image from Microsoft's Software Download site. Or use the excellent Windows ISO Downloader tool instead which works fine as well and supports downloads of all major Windows versions and editions. 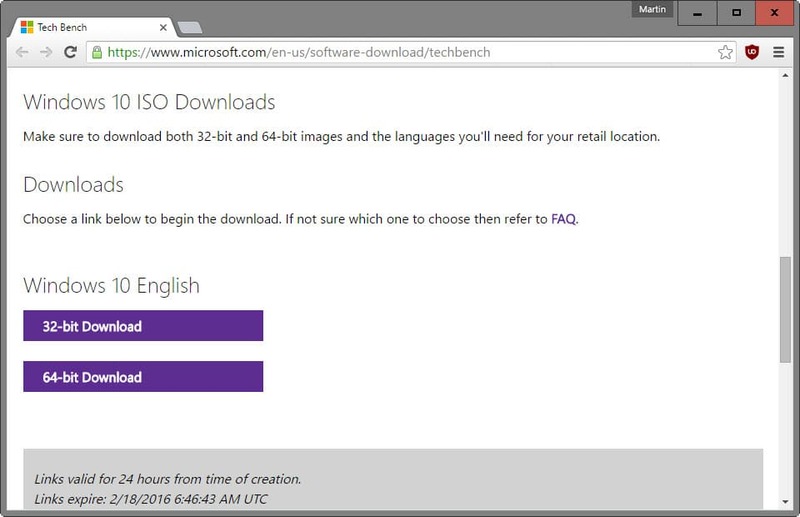 Microsoft's Tech Bench website for Windows 10 provides direct downloads for Windows 10 ISO images. 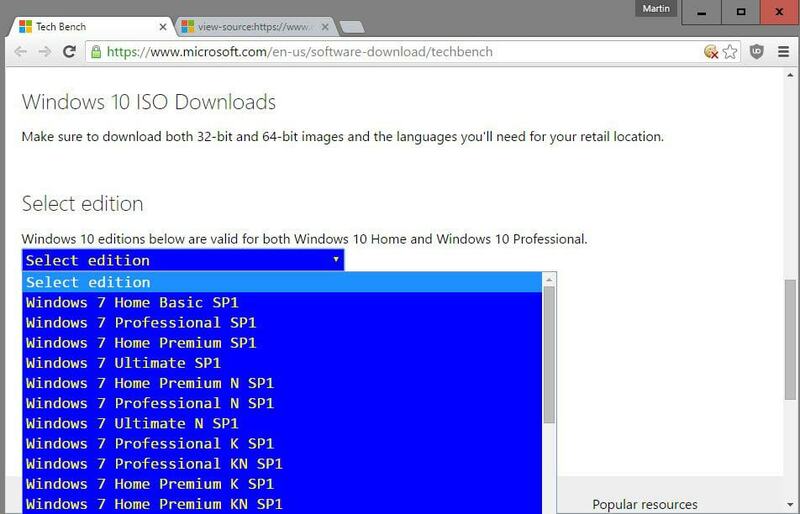 Downloads for Windows 10, which are valid for Home and Pro versions of the operating system are offered, and it takes a couple of clicks to start the download of the ISO image on the site. Note: Windows 10 Enterprise is not offered on the page. Select the edition that you are interested in, e.g. Windows 10 should be the one for most users, and click on confirm afterwards. The server validates the request, and displays a product language menu afterwards. Select the language you want supported and hit confirm once again. The request is validated again by the server. Download links for the ISO images are displayed, and you may select 32-bit or 64-bit versions of the selected version of Windows for download (or both). Links are valid for a 24-hour period only after which they expire and need to be requested again. The page offers no indication that ISO image downloads for previous versions of Windows, Windows 7 or Windows 8.1, can be requested there as well. If you analyze the page source code however, you will notice that Windows 7 and Windows 8.1 are mentioned there several times. That got some people thinking, and the result is code that you can run on the site to add download options for Windows 7 and Windows 8.1 ISO images to the page. 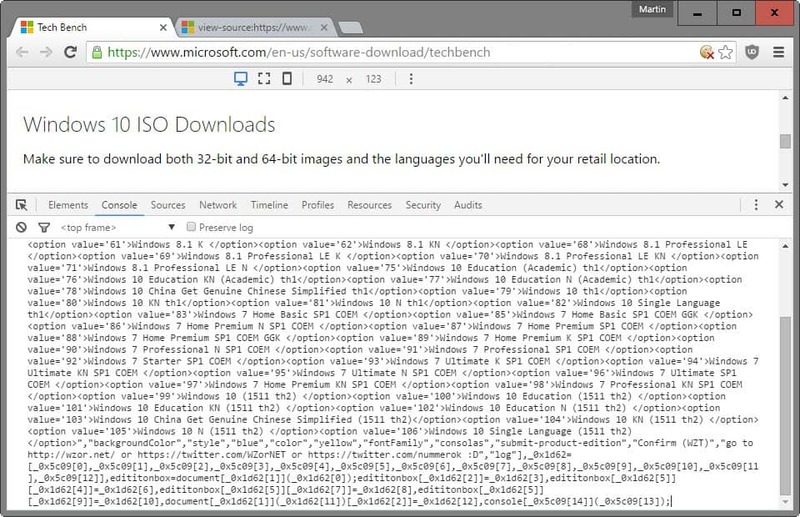 Open the Microsoft Tech Bench website in a browser of choice that supports Developer Tools, and here the console (e.g. Firefox or Chrome). If you are using Google Chrome, use Ctrl-Shift-J, if you are using Firefox, use Ctrl-Shift-K to open the console. Visit the Pastebin website and copy the code posted there. Paste all of it to the console and hit enter. To do that, click inside the console area and use Ctrl-V to paste it. Alternatively, right-click with the mouse in the area and select paste from the menu. The process is identical: select the desired version and hit confirm. Wait for server validation, select the desired language and hit confirm. The server validates the request again, and you get ISO download links for 32-bit and 64-bit versions of the selected Windows version. Windows N for the European market. Multimedia support is removed from the edition. Windows K for the Korean market. It ships with links to third-party media player software and instant messaging applications. Windows KN, a combination of K and N editions. See KB3010081 for additional information. The improved menu disappears when the page is reloaded, but you can repeat the operation again to display the additional download options again. (via Tech Journey). Note: Microsoft may plug this at any time but has not done so in the past two months since the code has been first posted. Find out how to download ISO images of Windows 7 or Windows 8.1 from official Microsoft servers. Not everyone has access to MSDN though. If you do, that’s your preferred choice of course. MSDN has an SHA hashes of said images though. What is not working, please describe what happens. I didn’t even know that I could download Windows 10 with 1511 update incorporated. Are you sure? I believe media creation tool downloads version 1511 of Windows 10. I notice on Microsoft’s Tech Bench website that tabs concerning Windows 7 an 8.1 make these versions downloadable as well, provided you enter the product key. What’s the point? Not available for users with Windows 7 OEM. If you have the Windows 7 OEM sticker with the product key on the case, these ISO’s will install and activate for you. Are the Windows just 32 bit? You can choose either 32- or 64-bit versions. This is the last step. It’s not working. After validating, it shows “error”. Tried with different browsers, still got error. Strange, worked fine on my end. What have you selected? Both x64 and x32 of Windows 7 Ultimate and Professional worked for me. 1. On the Pastbin page, scroll down to the box labelled “RAW Paste Data” and copy from there. 2. After pasting the code in the console you must press Enter before you can select an edition. Nevertheless, thanks mucho for the info. How up-to-date is the Windows 8.1 ISO, can anyone please tell me? Does it have Update 1 or latest cumulative updates integrated? The entry titled “Windows 8.1 with Update (multiple editions) (x86) – DVD (English)” matches the SHA1 above, so it must be the same as my download. This Win8.1 iso was released 2014.12.15, and includes the November 2014 Update Rollup. Hopefully the same applies to the iso’s for other versions of Win8.1 extracted from Tech Bench. Are these isos newer than the ones found on digitalriver a year or two ago? Those were like from 2011 and took ages to install all the updates. That’s a very good question. Nothing worse than doing a clean install from an old Windows 7 SP1 iso and having to download and install what seems like hundreds of updates. I’ve always kept a system image of the Windows 7 after all the updates have been installed. AFAIK Microsoft haven’t released or created any newer versions since Windows 7 SP1, can’t speak for 8.x or 10 as 7 is going to be my last Microsoft OS. Replying to myself here, like a true mofo: I downloaded 7 Ultimate SP1 and extracted it. It’s in fact from 2011, so updating these babies will take maaaaany hours. The positive side: Uncheck and hide all of the countless Windows 10 related “updates” and enjoy a nice clean OS. Thanks! It works after added it in GreaseMonkey! But do this download contains cumulative updates too (and if ‘yes’ which is the last date of the updates)? I’ve already had an SP1 ISO of Win7 x64 for a clean installation in this week, but I’ve have a list of ‘not apreciate’ updates too referred to Win10 upgrading to manual keep out. Thanks Martin, always useful topics. Following up on my own post here, but the “declutter” script no longer works. DO NOT USE as it will interfere with the dialog buttons needed. Apparently, playing such a game on VMware Station is a better choice. 8.1 Pro only has an “LE” version… What does the “LE” stand for? the November update did not work for me so i rolled back to windows 10 , how can i download it again ?? it does not come up in windows update . 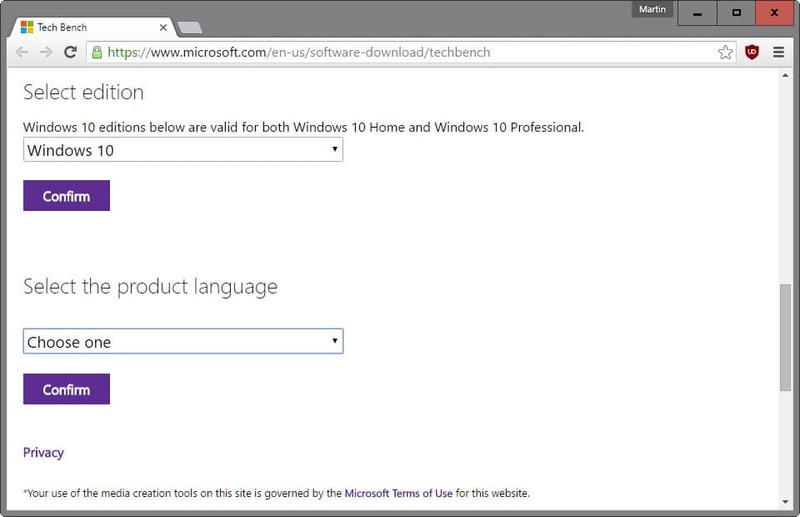 I believe that Tech Bench is the page linked from the Insider home page, and the latest Win10 ISO did Not have any updates since the original was posted last year. In case of disaster I would like to have a ISO available with *current* updates, service packs, etc. applied. Another way to download Windows 7: http://mirror.corenoc.de/digitalrivercontent.net/ . Thanks, helped me to corroborate the MD5 and SHA1 not find a page with some information. @ Mister M.: Like LAP, I used the digitalrivercontent page for the checksums. Thanks! are versions OEM, MSDN, RTM or RETAIL? 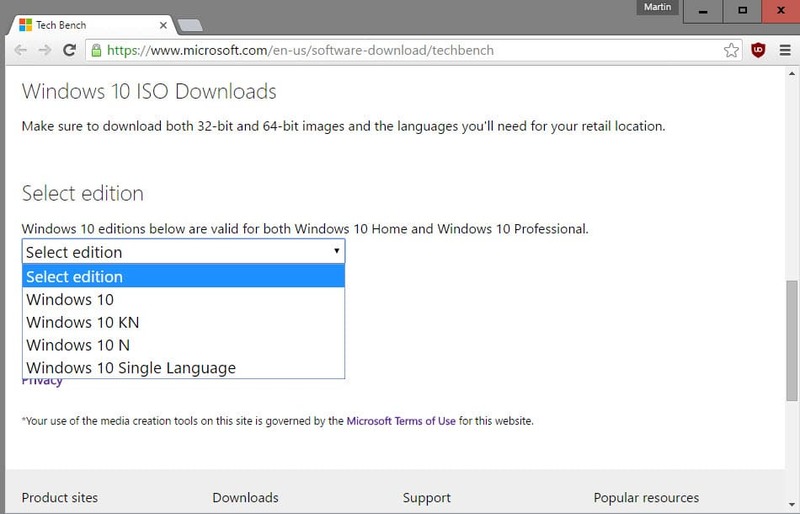 If you visit the Microsoft download pages for 8.1 and 10 ISOs with a non-Windows browser user agent, you can just download the ISO files directly from Microsoft rather than have to download and build locally with the Media Creation Tool. I much prefer this method as it allows you to hash check the ISOs as intact/legit. It works with simple user agent browser extensions on Windows. I’m not sure if it would work with Windows 7 ISOs too. I prefer the windows windows 7 onwards are crap and worse every time Windows 10 want to know more about you. He distrusted Windows 10, I mean by the news that there was in the vicinity of the security / privacy. Is Windows 7 Home Basic = Windows 7 Home Starter? May need to reload the page. English and English International are both available on all editions (didn’t check K series tho). Thanks very much, Martin. This is very handy for computers with OEM Windows 7 or 8.1. You can never be certain that you won’t have to reinstall from scratch one day. Great!! I just finished downloading Win 7 Ultimate 32/64. Perhaps post a link to Microsoft’s SHA-1 hashes or include them in the article? Browse Box “Products A-Z” , Select “W”. Select the OS you want. After landing on the the new page, either scroll to the ISO you need, or use the check boxes to the left to narrow your search. You may to check “All” instead of “32 or 64 bit”. On the listing of the ISO you downloaded, select “Details”. Hi!!! you are great!!! nice code and was so easy did it!!!!!!!! I have some questions: Whats is Windows version K or KN or N? I’m looking for a Windows 7 sp1 updated to march 2016… Is it possible? can you tell me how to get windows 8.1 enterprise..? This this ISO the up-to-date Windows 7 SP1 ISO file? Please be more specific. What is not working anymore? I just checked and it worked on my end. Juoa, in case you used my “declutter” userscript above, it blocks out the dialog button now for some reason. So make sure you’re not using that userscript and you should be ok.
We encountered a problem with your request. Please visit the Microsoft Support Contact Us page for assistance. Refer to Message Code 715-123130 and Transaction ID b060c267-64a8-43dd-ba0c-7d2df5231d3d. This worked as of a few months ago but doesn’t seem to any longer. This is still working. Make sure you copy the whole code. Thank you for the response. It gave me the motivation I needed to keep trying this over and over lol. For me this does not work in Chrome for some reason. (Latest build on Win 7) I tried it at least 15 times, literally. I then tried it in Firefox about 3 or 4 times, to no avail. I verified the code from Pastebin each time I tried it. After reading your post, I buckled down and tried in about 2 or 3 more times in Firefox and it worked. I have no idea why it didn’t work the first few times, but finally it did. I did the same thing every time, but for whatever reason it worked the final time lol. The steps are pretty simple so I’m not sure what happened, but either way I’m glad it still works. Thank you for posting this trick. The URL may be misspelled or the page you’re looking for is no longer available. When I try to go on windows10iso page it redirects me to the download tool. Can anyone please help me to download it? Even if someone uploads the Windows 7 Ultimate on some torrent I will be more than glad! Read my next post, it is totally working from the Win10 download page !!! So how can i get real MSDN MD5 hashes ? i just signed up live.com account. I prefer Windowstan for downloading Windows ISO images and Office IMG files. Pretty sorted and categorized items.